Before the Avengers and Fantastic Four were created, there was the Justice League of America. 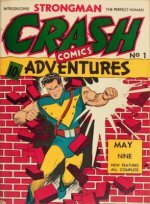 Consisting of DC’s main lineup of heroes, like Superman, Batman, Green Lantern, Aquaman and others, the JLA made their big debut in Brave and the Bold #28 (1960) before getting their own title later that year. The JLA’s first enemy in their solo debut is Despero, an evil ruler from Kalanor. 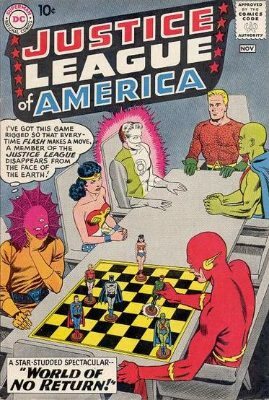 Tricking the Flash into a game of chess, Despero slowly displaces all the of JLA’s heroes to other worlds. Luckily, honorary member (and “edgy” beatnik teenager) Snapper Carr was able to defeat Despero on his own. Did you notice that the issue number of JLA #1 isn’t featured on the cover? 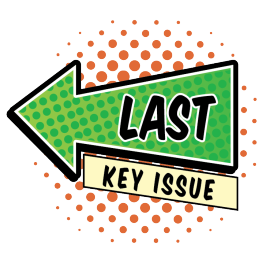 Instead, the issue number can be found on the inside. Surprisingly, Batman nor Superman (DC’s two most popular characters) are featured on the cover, and wouldn’t be until JLA #10. 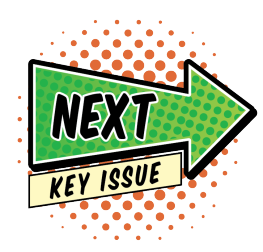 DC key issue comics are often under-valued compared to their Marvel counterparts. 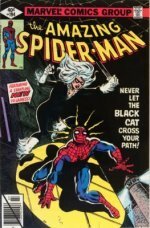 Remember that this is a 1960 issue. It is very scarce in high grade. November 2017 sees the Justice League of America movie coming out, but even so, prices remain sluggish on this book when compared to the true first appearance of the JLA in BB#28. Possibly values are held back on this book by the truly tedious front cover, showing the JLA members all sitting around doing nothing. Contrast that with the expressive action-packed fight scene on the front of BB#28 and it is another reason to invest in that issue instead.